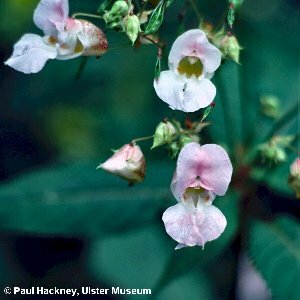 In 1938 the famous Irish naturalist Praeger described this plant as rare and cited the shores of Lough Neagh as one of its sites. 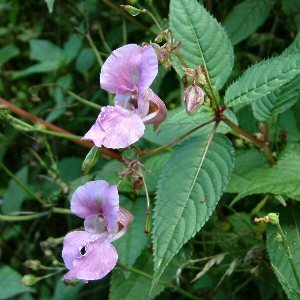 Now, sixty years on this Himalayan species, introduced for garden purposes, has spread along most large rivers and locally may dominate the vegetation. It is a tall succulent annual with variably coloured flowers followed by fruits which have an explosive method of seed dispersal. One of its 'common' names, coined in the 1950s, is 'policeman's helmet', which refers to the flower having the shape of an English police helmet. The common houseplant called 'Busy Lizzie' is closely related. Each plant produces about 2,500 seeds which fall to the ground at a density of between 5000 - 6000 seeds per square metre. The plant has similarly colonized many rivers on the European continent and recent research by two German botanists has shown that it competes for pollinators such as bumblebees with the native riverbank species, and so reduces seed set in these other plants. 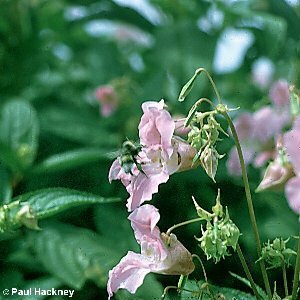 Its success in this is in part due to a very high rate of sugar (nectar) production - for instance about 47 times greater than the great willowherb (Epilobium hirsutum) and about 23 times greater than purple loosestrife (Lythrum salicaria). Seed set in marsh woundwort (Stachys palustris) is reduced by some 25% where it grows mixed with Himalayan balsam plants as compared to pure patches. This account is based partly on the work of D. J. Beerling & J. M. Perrins (for seed production statistics) and of L. Chittka & S. Schurkens (for competition for pollinators; reported in Nature, 7 June 2001).